Don’t get your hopes up. Despite its implications, the title of this month’s column in no way signifies an end to my ever-incessant ramblings. And you thought you had gotten lucky. Well, be afraid. Be very afraid. And not just because I refuse to go away. Beth has already set the tone with her cover art this time around, commemorating some of the scariest bastards SF has ever thrown at us. Keeping in the spirit of this spooky, spooky Halloween edition of First Light, I thought I’d share the works, Sci-Fi and otherwise, that have scared the crap out of me. I’ll even tell you about the time I saw a real, live (so to speak) ghost (I think). But fiction first. Actually, very little in the realm of entertainment really scares me. All things considered, it’s odd that this should be the case. When I was a kid, everything scared me. Everything. We’re talking World Champion Crybaby here. I don’t care how bad you think you were. If it was even remotely unsettling, my waterworks would start. I was a bona fide sissy. Sometimes all it took was a particular tone of voice. Many of you, no doubt, have heard Richard Kiley. He’s one of the more prolific documentary narrators out there and has been around for years. You can most readily hear him these days if you tune into the program Mysteries of the Bible on A&E. Well, when I was a kid in the 70s, he narrated a program that aired occasionally called The Body Human. I’d always found the sound of his voice vaguely upsetting, but one particular program of the series speculated what humans might look like as we further evolve. I sat horrified as Mr. Kiley told me that eventually humans would be smaller as a result of using our brains instead of our brawn. He rambled on about some other stuff and eventually got around to informing me that we’d no longer have ears, just two holes in our heads. Like lizards. I started bawling my eyes out. Being seven years old, I had no real concept of evolution. All I knew was that I didn’t want to lose my ears when I grew up. For the remainder of my formative years, Richard Kiley’s voice was synonymous with disaster. I couldn’t watch anything he narrated. NOVA soon merited similar damnation. Not only was it callous enough to tell me that the sun would one day burn out, but that it was also likely the human race would run out of food within the next ten generations. And all in the same episode. Again, having no concept of the time scale involved, I cried all afternoon. I don’t remember if it was the prospect of starvation or eternal darkness that got me most. Probably the former; I was quite the porker. And who could forget the Ghost of Christmas Past in Mr. Magoo’s A Christmas Carol? You remember him: faceless, sternly pointing, never talking. Those quivering, skeletal fingers were enough to keep me up all night, cartoon or not. Very little of the so-called “adult” fare I’ve encountered since has caused me such genuine chills—you know, the kind that emanate from your bowels and slowly overtake you. Alien? Pffffffttt! Drool acid on someone else, please. Jason? Go jump in a lake. Michael Meyers? Donald Pleasence is much harder to stomach in those movies. Freddy Kruger? Chortle! The thing that makes it impossible to fear most of Hollywood’s assorted creatures and psychopaths is that their victims are usually so annoying that you can’t wait to watch them get sliced, diced and spit out. As a result you have movies that can be a hell of a lot of fun. Some even reach tense. But none are truly scary. 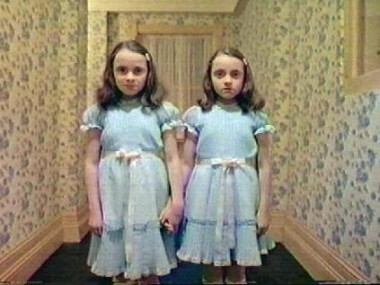 The one that has come closest for me is The Shining—Kubrick’s version, not the lame made for TV mini-series. It isn’t because of an ax-wielding Jack. He’s just comedy relief. The true star of that movie is the hotel itself. You can feel yourself in Danny’s place, big-wheeling down those corridors, surrounded by the Overlook’s goulish past. The oppression and menace practically ooze off the screen. And those twins just give me the willies. I also happen to think The Shining was Stephen King’s best book. But it was by no means his scariest. ‘Salem’s Lot holds that distinction. The book is deceptive because the fright blindsides you. You’re plugging along, reading comfortably in bed when all of a sudden you realize that you’re next to an open window. Struggling not to look outside (lest you peer into the eyes of the undead) you fumble for the blinds and angle yourself so the window is completely out of your line of sight. My only other true literary scare comes from an odd source, none other than the master himself. In the first act of Hamlet, there’s a scene where the ghost of Hamlet’s pop has a cameo. He disappears and shortly thereafter Hamlet and his buddies vow to avenge his murder. As they make their oaths, the disembodied voice of old Hamlet the king floats up from nowhere, admonishing the group with one word: “Swear!” Don’t ask me why, but as this scene unfolded, I felt a stab of fear each of the four times the ghost repeated that word. It seems innocuous and a bit dopey out of context, but there you have it. It scared the hell out of me. A pitifully short list. But that’s not to say nothing at all scares me. What gives me real creeps is the stuff that could be true, but which no one really knows about for sure. Aliens are high on the list. Sure, you watch Sightings and the stories are extremely intriguing. This one was probed. That one woke up in her car with missing time and her earrings dangling from her earlobes backwards. And what about those siblings who’ve found matching implants in the napes of their necks and recently recovered identical memories of being told to ignore them? It’s engrossing. But then a few hours pass. It’s dark out and for some reason you can’t get the abduction stories out of your head. You lose the thread of the Star Trek rerun you were enjoying a second ago, suddenly and quite unexpectedly in the grip of fear. But you don’t take your eyes off the screen. No way! To your right is the sliding glass patio door, a blank eye looking out on the night. To your left is the darkened apartment, suddenly full of shadowy menace. And that half-opened closet door doesn’t even bear thinking about. You refuse to look anywhere but the TV because if you do, you’re positive you’ll see the dull gleam of huge bug-like eyes looking back from somewhere in the shadows. There’s a sudden noise. Perhaps the walls settle with an audible creek, or the wind knocks something off the kitchen counter. It makes no difference really. You practically jump ten feet, convinced that you’re surrounded. You’ve finally had enough and want to go to bed. This is when the real fun begins, because you realize that you will eventually have to turn out all the lights and walk through the dark apartment to an even darker bedroom. You’ve done this a gazillion times before without even thinking, but now it seems like a gauntlet of death. And once you get to the bedroom, you scramble into bed as fast as you can and refuse to open your eyes—scarcely dare to move!—because you’re convinced they’re going to take you at any moment. Silly scenario? I guess, but it’s happened to me more times than I care to admit. The power of suggestion and imagination can be very powerful. And I know that I’m not alone. My old college roommate told me that when he read the book Communion he sat up every night for a month afterward, baseball bat in hand. And he was cruel enough to tell me why. It seems that the guy who wrote the book was in bed reading one night, his wife sleeping peacefully beside him. There was a bathroom off the bedroom, and he chanced to look up just as an alien poked its head out of the half opened bathroom door. Paralyzed with fear and unable to move or speak, he watched in horror as a bunch of the suckers filed out of the bathroom and took him away. The nugget I found most disturbing was that the bathroom had no windows. You’re reading this now and probably laughing at me. But mark my words! You’ll remember this sometime tonight whether you want to or not, and suddenly it won’t be so funny. I’m getting chills just writing about it. My wife recently went to a clearance sale at our local library and brought me a stack of books. Communion was among them. I thanked her for thinking of me, but there’s no way in hell I’m ever going to read it. Sorry honey, but I’ll never sleep again. On the other hand, there’s another pursuit that I feel compelled to engage in, even though I know I’ll be terrified when night arrives. In a word: ghosts. I have researched them time and again, alternately fascinated and horrified by what I learn. I don’t know why I do it to myself, but the lure is undeniable. Of course the result is the same as the one I outlined above. Just replace aliens with specters or cowled black figures. And even though there are times when the hobby positively scares the piss out of me, I know that I will one day find a ghost society and join in on a ghost hunt. I mean, how could I pass up such an opportunity to scar myself for life? I think I’ve already seen a ghost, however. And oddly enough, it wasn’t scary at all. My sister has a thing for old headstones, so we took a drive out to eastern Long Island to see some of the older cemeteries. My wife and her friend tagged along. We were soon browsing through a fairly small cemetery. There was a maintenance guy cutting the grass and as I looked in his direction, I noticed a girl skipping along, playing a flute. I couldn’t hear the flute, but I attributed that to the noise from the mower. She wasn’t very far away. Maybe a couple of rows down. So I got a good look at her. She had brownish red hair done up in a braid ala Little House on the Prairie and even wore clothes that looked like they were from that era. I nudged my wife, but she had seen her at almost the same instant. So had my sister. We went to get my wife’s friend and show her. But when we turned back (if you haven’t already guessed) flute girl was gone. As I said, it was a fairly small cemetery and we could see every exit clearly. We hadn’t turned our attention away long enough for her to get far, since she was in relatively the same area we were. Yet she had vanished without a trace. I don’t know how else to explain it other than that flute girl was a ghost. But oddly, there’s no fear in the recollection, no goosebumps—only a clear image of what I saw, corroborated by others far more rational than I. Sorry if you were expecting me to scare the bejesus out of you. But I’m afraid my brush with the other side has only yielded this mildly interesting story. The masochist in me insists that I ask this: if readers have any of their own real-life ghost stories, I’d love to hear them. Leave a comment.